A liver transplant from a non-beating heart donor was performed in a hospital in southern Italy for the first time. Two kidney transplants were also performed thanks to the same donor. 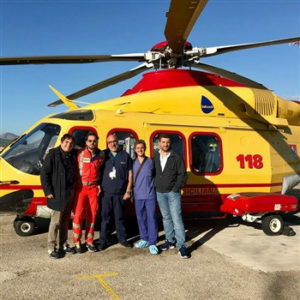 This procedure was made possible because of a new program aimed at increasing the number of organs available for transplants, now implemented also in Sicily with the contribution of the Regional Transplant Center and IRCCS ISMETT in Palermo. According to this program, the organs of a deceased potential donor can be procured even after cardiac arrest if supported by an extracorporeal circulation technique before procurement. Sicily is the sixth region in Italy, the first in the south, to be included in this important program of the National Transplant Center. Currently, the program is active in Tuscany, Emilia Romagna, Veneto, Lombardy, and Piedmont. This transplant was possible thanks to an organ donation reported by the ICU of Umberto I Hospital in Syracuse, directed by Dr. Maurilio Carpentieri. The donor was a 60-year-old woman affected with ALS (amyotrophic lateral sclerosis) who had refused treatment after being aware that her conditions were worsening every day. Her will not to be treated was communicated to Dr. Graziella Basso, transplant coordinator at Umberto I Hospital. Just days ago, when she was in the ICU of Umberto I Hospital, the woman’s clinical conditions became so serious that there was no hope for recovery. Her husband, children, and sisters immediately informed Dr. Basso of the patient’s will to donate her organs, as well as her intention not to undergo any medically futile treatment. In order to respect the woman’s will, the Regional Transplant Center planned to assist the patient toward a slow reduction of treatments and alert ISMETT’s physicians to activate organ surveillance to enable the procurement. Through the continuing support of the helicopter rescue service 118, coordinated by Dr. Fabio Genco, an ISMETT team composed of Dr. Gaetano Burgio and perfusionist Andrea Giunta, were able to travel to Syracuse, where together with their colleagues from the Syracuse ICU, started abdominal organ perfusion with the extracorporeal circulation system (ECMO), routinely used to support the organs of patients with extremely impaired conditions. The non-beating-heart donor transplant is different from the traditional organ procurement protocol (normally occurring on a brain-dead and beating-heart donor) because death is ascertained at the end of cardiac activity, and procurement is performed after a 20-minute observation period that ends the death-ascertaining process. This protocol allows clinicians to procure organs even after a prolonged period without cardiac activity through the use of the ECMO system, which, used after ascertaining death, maintains oxygenation and normal body temperature, and delays the ischemic damage that would jeopardize the organs to be used for transplantation. The protocol, implemented by ISMETT clinicians, allowed the organs to continue receiving blood and oxygen through ECMO so that they can be procured and, later, transplanted. This strategy is an effort to obtain a larger number of organs in Italy. “First I want to thank the donor and her family for their great generosity, and all the professionals of the regional and national transplant network involved in such a complex and arduous procedure. This is another example of excellence in Sicily, a region that has accepted this new cultural, clinical, and logistical challenge,” said Ms. Bruna Piazza, Director of the Regional Transplant Center in Sicily.